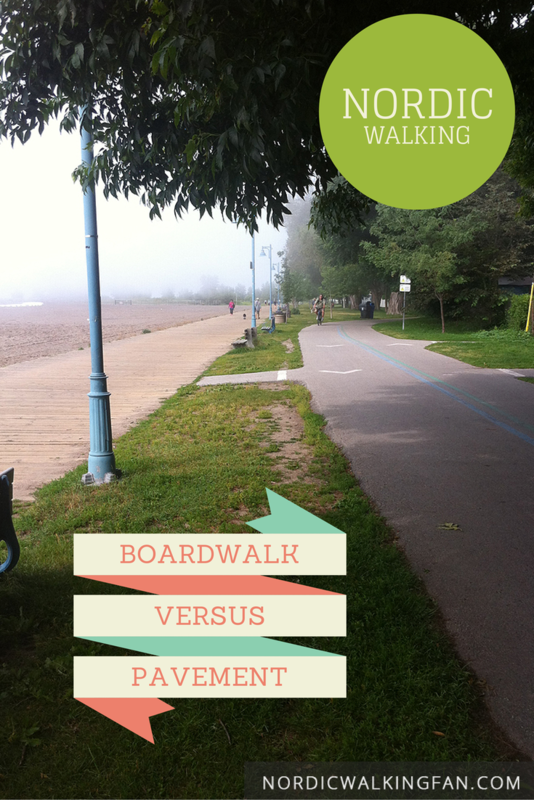 Which would you prefer when Nordic Walking when faced with a choice of boardwalk or paved surface? I currently prefer paved surface; but most of my friends prefer boardwalk. Where I live in the Beaches area of Toronto, I have a choice of both. (There aren’t really any dirt trails.) 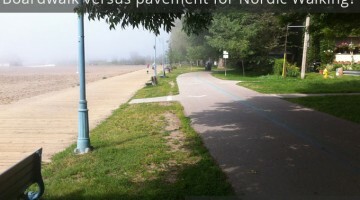 In some places, the two run side by side, but in most places the paved path is about 10 metres north of the boardwalk. The paved path used to be called the “cycle path” and have sprayed markings on it indicating bicycles only, but now it’s been rechristened to be a “fitness trail” recognizing that it’s also being used by roller bladers, joggers pushing baby strollers, skateboarders and now, Nordic walkers. It is very busy at times. When I go out with friends norking along the lake, I often get them to try both the boardwalk and the pavement, to see which they prefer. 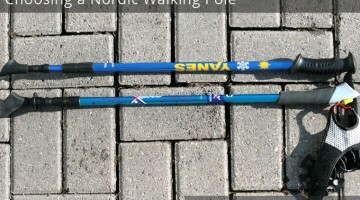 Here’s a list of things I’ve thought of so far for pros and cons of Nordic walking on each. NOT plowed / cleared in winter. Owing to its nature (boards) the city can’t send its small snow plows along it. It gets covered with compacted snow that turns into sheet ice and stays that way for weeks and weeks on end, making it treacherous. 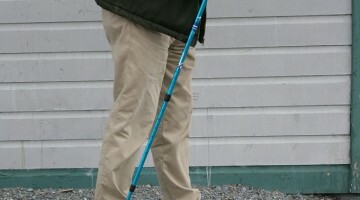 There’s nothing very healthy about spending the next six months in a hospital with a broken hip because you tried to Nordic walk over sheer ice. 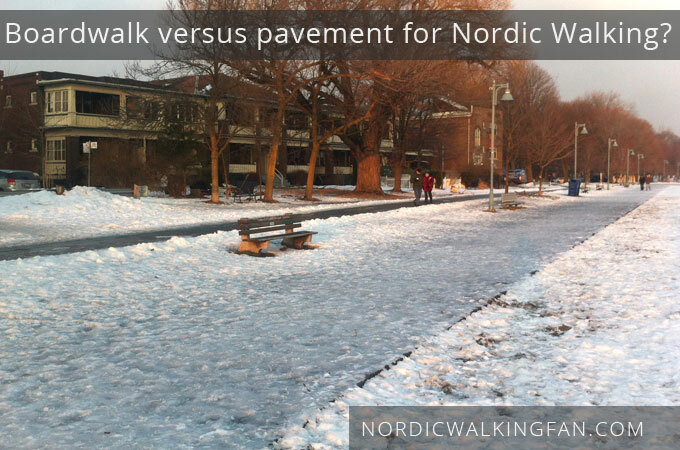 Winter: boardwalk iced over, paved path is cleared. On the boardwalk, you’ll only encounter walkers, joggers and people with baby strollers. Cyclists, rollerbladers and skateboarders avoid the boardwalk completely (likely owing to the irregularities I’ve described above as well as the occasional spike that has worked its way out of a plank.) . Often plowed in winter, and on warm days snow and ice on it will melt and clear away (while it remains on the boardwalk.) While it will of course get slippery when iced over, it does not get as slippery as the boardwalk does in the rain. 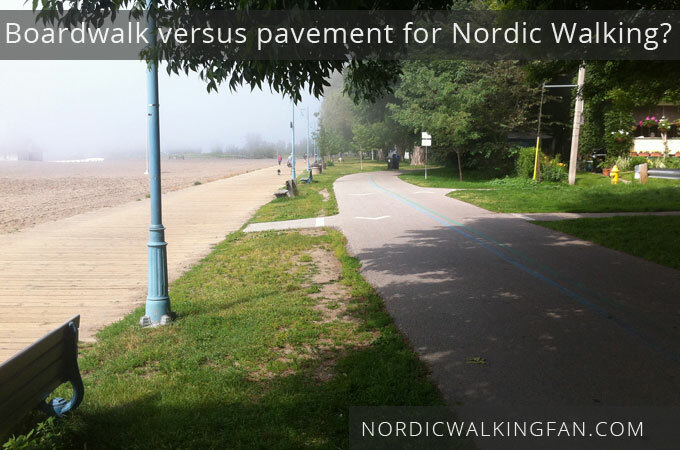 So, that’s why I prefer the paved surface trail for my Nordic walking: a bit more avoidance of possibly vicious dogs, not having to watch every step, ability to relax a bit more, and, a safer walking surface. The caveat is that I must always hug to the right to be respectful of faster moving traffic and let them whiz by, but I’m okay with that. Dirt trails with no ‘wheeled traffic’ at all are amazing, but the above are the two choices I face where I live.